The federal government uses very carefully manipulated numbers to cover up the crushing economic depression that is going on in this nation. For the month of September, the federal government told us that 142,000 jobs were added to the economy. If that was actually true, that would barely be enough to keep up with population growth. Sadly, the truth is that the real numbers were actually far worse than that. The unadjusted numbers show that the U.S. economy actually lost 248,000 jobs in September and the government added more than a millionAmericans to the “not in the labor force” category. When I first saw that number I truly believed that it was inaccurate. But you can find the raw figures right here. According to the Obama administration, there are currently 7.9 million Americans that are “officially unemployed” and another 94.7 million working age Americans that are “not in the labor force”. That gives us a grand total of 102.6 million working age Americans that do not have a job right now. That is not an economic recovery – that is an economic depression of an almost unbelievable magnitude. This is something that my friend Mac Slavo pointed out the other day. I encourage you to read his analysis right here. If we measured unemployment the way that we did decades ago, we would all be talking about how similar Obama’s economy is to the Great Depression of the 1930s. But instead we let the feds get away with feeding us this completely fraudulent “5.1 percent” unemployment number and most of us believe the mainstream media when they tell us that everything is just fine. Well no, everything is not just fine. At this point, the labor force participation rate is the lowest that it has been since 1977. 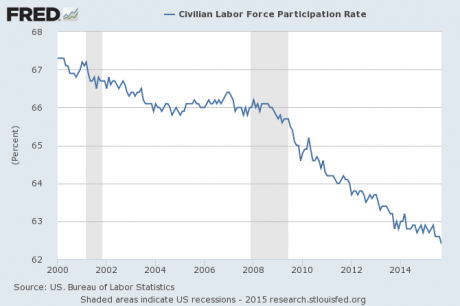 And the labor force participation rate for men is at the lowest level ever recorded. The only way that the federal government has been able to get the official unemployment rate to go down so much is by pretending that hundreds of thousands of Americans that have been unemployed for a very long time “leave the labor force” each month. 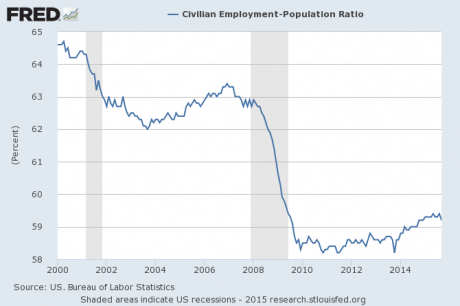 The reason this number is falling is because lots of Americans have been losing jobs lately. The jobs report today has been described as “ugly,” though it certainly didn’t, or shouldn’t have, come out of the blue: Layoffs in the energy, Big Tech, retail, and other sectors have recently mucked up our rosy scenario. “The third quarter ended with a surge in job cuts,” is howChallenger Gray, which tracks these things, started out its report yesterday. In September, large US-based companies had announced 58,877 layoffs. In the third quarter, they announced 205,759 layoffs, the worst quarter since the 240,233 in the third quarter of 2009! Year-to-date, we’re at nearly half a million job cut announcements (493,431 to be precise), up 36% from the same period last year. Some of the companies that have recently announced layoffs include Wal-Mart, RadioShack, Delta, Sprint, ConAgra, Caterpillar, Bank of America, Halliburton, Qualcomm, Microsoft and Hewlett-Packard. If you need to find a job or you plan to switch jobs in the near future, time is of the essence. Jobs are going to become much, much harder to find in the months ahead, and so every single day of job searching is absolutely critical at this point. Right now, there are more than 100 million Americans that get some sort of assistance from the federal government every month. Government dependence is at a level that we have never seen before in U.S. history, and it is going to get a lot worse. If we get to a point where the government is either unwilling or unable to take care of all of these people, we are going to have a massive societal problem on our hands. More than a third of the people living in our nation cannot independently take care of themselves, and more Americans are falling out of the middle class every single day. When the welfare state starts breaking down, the chaos that will ensue will be far worse than most people would dare to imagine. Are job losses and layoffs starting to happen in your area?